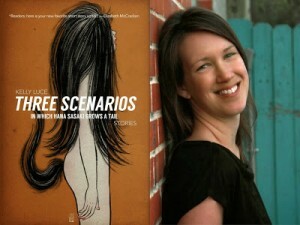 Kelly Luce’s debut collection, Three Scenarios in Which Hana Sasaki Grows a Tail—the first book from Austin small press A Strange Object—is garnering attention, something that’s difficult for short story collections to do. But it’s no surprise that this one is making waves. This lovely book is a joy to read. Luce’s stories show the kind of attention to the human spirit that makes short stories fun to read and makes the form special: there’s just a hint at magic and the fact that something otherworldly might be possible. Luce uses her stories to examine moments of grief, joy, love and the connections between people. And did I mention? Her writing is just damn good. I was thrilled to be able to have the chance to catch up with Luce and to ask her about her influences. Hana Sasaki is set in Japan, in a world just slightly different from our own. Toasters foretell death. Machines can measure a person’s “lovingcapacity.” Lines blur between empathy and sympathy. Luce uses her stories to examine the nature of relationships—how they both bond us together and keep us from moving on. Her stories are a lovely mix of science and imagination and legend. And tails. Literal tails. I couldn’t wait to talk to her about all of it. The Nervous Breakdown: What struck me about Three Scenarios in Which Hana Sasaki Grows a Tail is how you use fantasy and the suggestion of other-worldliness to get closer to an emotional truth, in some cases, than I think you could have done with a literal kind of storytelling. When you write, do you think about genre? How would you define your book to someone who hasn’t read it yet? Kelly Luce: I agree: a bit of other-worldliness goes a long way. It’s true that some of the stories in Hana Sasaki contain magical elements, but magic’s not one of the central concerns of the book. Unless you’re talking about the magic of the everyday. Genre labels are heuristics—shortcuts for categorizing books that might be useful on the surface but upon closer inspection actually mean very little. I don’t think about those labels when I write. It’s all I can do to stay focused on the story and the language. It’s less thinking, even, than sensing—brushing up against a feeling and hoping it won’t evaporate before I get it on the page. TNB: Why tails? Please talk to me about the tail thing (which I loved). KL: I suppose tail growth falls into a larger category of outward changes that symbolize internal transformation. We love to mark ourselves: big birthday? Commemorate with a tattoo. Just got dumped? Chop off that hair. And our bodies do this for us, sometimes–our eyes give away when we’re tired, our skin when we’re stressed. The body often knows things before our conscious mind knows them, a divide that can yield some weird fruit when exploring a character in a story. A tail is a nod to that divide, and to our animal selves, which are often closer to the surface that we’d like to acknowledge. TNB: You said recently in an interview that they say you write first book about childhood. In what ways is this that book for you? In what ways is it not? KL: I was an intensely private only child and lived in my own world most of the time. A real space cadet. So in terms of wacked-out imagination, you might say this book is a reflection of that early existence. It’s not about my childhood in obvious ways: I’m not Japanese, knew nothing about Japan as a kid other than that my Nintendo was made there, and I’ve never owned a psychic toaster, tragically lost a sibling, nor been disappeared by a karaoke machine. The years I lived in Japan, in my early twenties, felt like a second growing up in many ways. You learn a lot about yourself when you live someplace where you’re effectively mute and illiterate. Your senses recalibrate and you start to see parts of yourself that maybe aren’t as great as you thought. So that transformation, combined with the other-worldliness of living in a place that was, at times, incredibly foreign, does inform the book. TNB: I also read that you would list Bender, Dybek, Calvino and Saunders as your literary influences. Do you find that you have to distinguish yourself and your writing when your own work is being compared to someone like, say, Bender? Do you think about the literary landscape as you’re working? Are you writing toward a target, or is that separate from your process? KL: I’m thrilled when my work is compared with Aimee Bender’s. But I don’t think anyone will get us confused. Same with Murakami, another writer reviewers mention when talking about Hana Sasaki. Comparisons are useful in the same limited way genre labels are useful: they’re signposts for when readers are first encountering a writer or book. If I think of the literary landscape when I’m working, it’s when I’m stuck and am looking for inspiration, asking myself, “Who would know how to solve this problem?” Then I go read him or her. KL: I studied cognitive science and music, both of which pop up in the stories from time to time. The plot of the last story in Hana Sasaki, for example, revolves around a scientific device called an “amorometer,” which supposedly measures a person’s capacity to love. It sounds pretty out-there, but scientists these days are doing some crazy stuff in terms of quantifying emotions, measuring aspects of consciousness, looking at how consciousness itself actually functions. Other experiences I had in Japan found their way into the stories. I sang a lot of karaoke, for instance. And not just drunkenly with friends, but alone in the afternoon when you could stay for five hours at a flat rate. And “Ash,” a story in which the narrator is imprisoned on a false charge of bicycle theft, is based on my own stint in jail. TNB: “Rooey” stuck with me, in particular, because of the subtlety of the transformative shift, and beautifully it all followed from the first line, “Since Rooey died, I’m no longer myself.” Can you talk to me about how you wrote that story? KL: It took a long time. The idea first came from the title of a song by The White Stripes. (I won’t say which, but once you’ve read it, you’ll be able to figure it out.) I’d been thinking about the death of a friend’s sibling, and how f-ed up the world seems when a young person dies, and began from there. The story languished for a few years; I could never get it right because, I see now, I didn’t know what it was really about. It was so gangly and inelegant and that annoyed me. Another death spurred me to look at it again. At that point I was struggling with grief—my own, yes, but mainly that of a close friend. And I realized that there is nothing elegant about fierce grief. TNB: I saw a lot of characters in your book—in “The Blue Demon of Ikumi,” “Pioneers,” “Amorometer”—who are examples of how we try to stay connected to each other, and why. Did you set out to tell a particular type of collection, say, stories about love or relationships or loss? Or even stories set in Japan, originally? Or did each one come to you organically? KL: During the period I wrote the stories in Hana Sasaki, I also wrote stories that had nothing to do with Japan. But after I’d written a few Japan stories, I thought it would be fun to try and fill a book with them. At that point I consciously started coming up with Japan-inspired ideas. Of course, most of the stories in the book aren’t about Japan, per se, but about people. The big thematic concerns of the book—relationships, loss, memory/nostalgia, ephemerality—arose organically, possibly due to the Japanese connective tissue. TNB: Your collection is really witty; the serious and sad elements are mixed with levity. I think that gives the stories each a really nice sense of balance, and overall this collection just has such a nice rise and fall. Have you heard the term “light and shade”? I kept thinking of that as I was reading. The high and the weird gave contrast to the low. Do you have conscious notes that you try to hit as you write? When you read short stories, what gets your attention? Who are you reading right now? KL: That’s a flattering observation, thank you. As I mentioned, when I write, I mostly just try to get it all out. But in revision, I think you’re right: my instinct is to strike a balance among the elements in a story, whether it’s high/low, realistic/fantastic, tragic/comic. It gets to a point where I just feel like the story needs Something. I may not know exactly what, but I know what kind of feeling the Something needs to create. With enough bumbling, it shows up. I love stories that can render nostalgia authentically, without coming across as corny or overly wistful. A lot of Japanese writers are good at this: Soseki, Kawabata, Banana Yoshimoto. And there’s nothing like a funny, surprising detail to make a story come to life. One of the books I’m reading right now is 18% Gray, by Zachary Karabashliev. There’s a line in there about the narrator’s boss “shaking hands energetically, the way only short people do” that made me laugh and brought the scene to life. TNB: What’s next for Kelly Luce? Today, or in a more general sense. KL: Writing-wise, I’ve been working on a bunch of different stuff since I’m in grad school—short stories, poems, a really bad screenplay. I’ve also been working on novel for a while now. It’s about a Japanese-American woman who, as a child in Japan, murdered her bully. I’m hoping to finish it before next summer. And today…I’m going to play some Ultimate Frisbee, which exhausts me and keeps me sane. HEATHER SCOTT PARTINGTON was raised in California’s central valley. She teaches high school English and lives in Elk Grove, California with her husband and two kids. Her writing has appeared at The Rumpus, Bookslut, and Under The Gum Tree. Heather is currently the Book Reviews editor at The Coachella Review. She holds an MFA in Fiction from UC Riverside’s Palm Desert Campus. I read this book in one sitting, it’s that great. Not like anything I’ve ever read. My favorite stories were “Rooey,” about a mythologized dead brother & the narrator’s huge (literally) physical change as she deals with that loss, and “Cram Island,” about a wacked-out karaoke machine. I expect big things from this author.